Create your own macros for the Visual Studio. 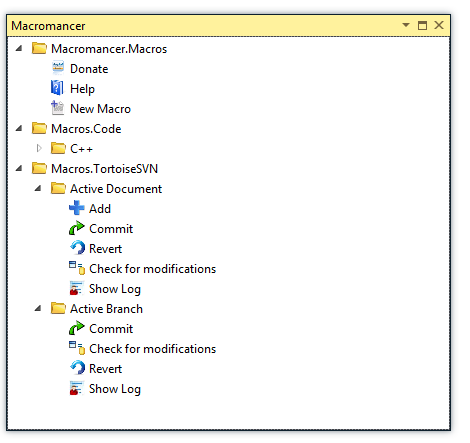 Macromacner is a Visual Studio extension package that allows you to create your own macros for the Visual Studio IDE. Instead of creating a new full package for simple tasks you can use this tool to easily implement the additional functionality that you need. Macro projects are .NET assemblies and can be implemented in C# or VB.NET. This gives a great advantage to the programmer as he can benefit from all the features that the Visual Studio offers, such as intellisence, debugging and much more. Hence macros can be very simple and contain a few lines of code or they can be massive and include other dll assemblies as well. If you are familiar with .NET then creating macros will be a very easy task for you after getting familiar with Macromancer and Visual Studio API. The macros that you will create will be placed to the Macromancer window tree and optionally to the Visual Studio Menu and Toolbar. The following is the template of the macro class that should be implemented in order for a new macro to be created.